San Luis Obispo (SLO) County, in the beautiful Central Coast of California, is home to one of the premier social dance scenes in the United States. Social dance is a category of dance styles which can be performed with a variety of partners in a relaxed, social setting. While many people think this type of dancing if primarily for competition, locally less than 5% of the dancers are competing; the rest of the dancers are doing it simply for fun. Some of the dances taught here on the Central Coast include East Coast Swing, West Coast Swing, Argentine tango, foxtrot, rumba, salsa, waltz, cha cha, nightclub, the hustle, two-step, country and western, ballroom and more. While many people feel intimidated at the prospect of what sounds like complicated dances, the reality is learning these dances are readily attainable. Some of the best local dance classes are offered by the fun and nimble-footed Linda Drake through SLO Dance. Linda offers over 20 years of local professional dance teaching experience. Linda and the other dance teachers include a number of nationally-recognized award-winners. There are classes of all levels, including many beginning classes. She and her other SLO Dance teachers provide skills, patience in a friendly, fun atmosphere which makes it possible for anyone to learn to dance. Linda shared her oldest student was at least 84 and her youngest age 12. Many of the skilled dancers at such public venues as concerts in Mission Plaza, Templeton Park, Paso Robles Park, and Arroyo Grande Park have taken dance lessons from SLO Dance or other local dance teachers. Linda started dancing with her high school drill team. She entered and did well at the Miss Dance Competition, even though she had no formal dance training. At age 18, she was hired to teach at an Arthur Murray Dance studio. While teaching there, Linda received the coveted Top Female Instructor in the Nation award. She has also been awarded Top Professional Instructor by the World Dance-O-Rama. In order to compete professionally, she had to leave Arthur Murray, which was a difficult decision. Her decision was rewarded when her professional dance career got off to a stellar start when she became the National East Coast Swing, Jack and Jill Champion in 1984. Throughout the 1990s, she was consistently ranked in the top six female competitors in West Coast Swing. She also had the honor of choreographing several PBS dance specials including Dancing through the Decades. She also opened her own business teaching dance in Southern California, and in 1993, twenty years ago, she started teaching in San Luis Obispo. Linda continues to participate in some dance competitions, as do a number of her teachers. Lessons through SLO Dance occur weekly on Wednesday and Thursday evenings at the Oddfellows’ Hall near downtown San Luis Obispo. Classes are offered either in a series of successive classes, or tailored to be a “drop in class.” Generally, two different classes are offered at the same time, but in different rooms, with a total of six classes offered each evening. SLO Dance also hosts monthly themed dance parties at the Oddfellows’ Hall. Linda has been doing local monthly “Dance Invasions” with her students at such dance-friendly venues as The Madonna Inn and Big Chill Night. On a designated Friday or Saturday, people initially meet for a dance class, such as East Coast Swing or foxtrot, from 6:30 p.m. to 8:00 p.m., and then Linda and the dancers venture as a group to the planned Dance Invasion site. This is a way for dancers to try their new dance skills in the reassuring company of their dance classmates. In addition, SLO Dance offers free dance lessons a half hour prior to the start of the monthly Saturday SLO Blues Society concerts, which gives the person a chance to practice the new steps learned. Linda especially enjoys opportunities for her students to dance to live music. She likes to schedule Dance Invasions with live bands which play danceable music. To that end, on May 11, 2013 she scheduled a Dance Invasion is scheduled for the dynamic, sassy blue’s performance of Kaye Bohler at the May SLO Blues Society concert. Kaye sings “blues-flavored soul and R&B reminiscent of Aretha Franklin and Tina Turner.” Kaye’s 2011 CD Like a Flower was named one of the best by Downbeat Magazine. When interviewed prior to the concert, Kaye stated she was eagerly looking forward to returning to play in San Luis Obispo County where she previously lived and performed. Her upcoming performance starts at 8:00 p.m. at the SLO Vets Hall in San Luis Obispo. Kaye also performs throughout California and other West Coast locales. Cal Poly (California Polytechnic State University) in San Luis Obispo also has an active dance teaching and performance community. About ten years ago, Chris Ellwood started out taking lessons at Cal Poly, then became the President and eventually started a dance competition team. Even though he is no longer a student, he is the Director of the Cal Poly Ballroom Dance Club and Sports Team. They provide weekly lessons at the Architecture Building for all ages; Chris noted that they have retirees who regularly take lessons. A variety of classes are taught including samba, waltz, paso doble, salsa, mambo, nightclub two-step, rumba, East and West Coast Swing, foxtrot, cha cha, and American and Argentine tango. Every February, Cal Poly Ballroom Dance Club offers an annual competition which attracts approximately 300 dancers. More info is available at www.cpdancesport.org/comp. SLO Swing, also consisting of Cal Poly students, features Lindy Hop, which is sometimes referred to as the original swing dance. Lindy Hop started in Harlem in the 1920s and 1930s, which evolved from jazz into a fusion of dance mainly based on jazz, tap, breakaway, and Charleston. They sponsor a number of workshops and events including the Lindy Exchange. Argentine tango is a sensual partner dance originated in the 1890s along the Rio de la Plata, the river separating Argentina and Uruguay. It has become a popular dance worldwide. Laura Andes invites people to “come and share in my enthusiasm and passion for this spectacular and magical gift called Tango!” She noted that for a community this size that there is a very active tango community, typically with five or six tango events per week, including lessons, practicas, and more. 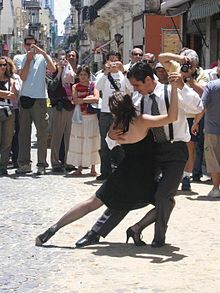 Laura’s dedication to authentic Argentine tango led her to immerse herself in tango dance and culture by spending four weeks in Buenos Aires in 2009 and six weeks in 2011. By doing this, she became recognized as a regular at the Buenos Aires milongas, which allowed her to learn by dancing with true experts. She also enjoyed the opportunity to sample the incredibly bountiful selection of specialty tango shoes. Laura offers a class for students of all levels “by donation” the third Tuesday of each month.